Armed police keep watch in a street in Kashgar, Xinjiang Uighur Autonomous Region, China, March 24, 2017. The U.S. State Department on Tuesday expressed deep concern over China's "worsening crackdown" on minority Muslims in the Xinjiang region, as the Trump administration considered sanctions against Chinese senior officials and companies linked to alleged human rights abuses. Any sanctions decision would be a rare move on human rights grounds by the Trump administration against China, with which it is engaged in a major trade war while also seeking Beijing's help to resolve a standoff over North Korea's nuclear weapons. 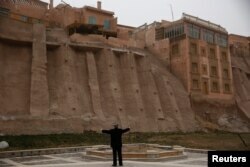 An ethnic Uighur stetches during his morning exercise outside the old town in Kashgar, Xinjiang Uighur Autonomous Region, China, March 23, 2017. "We're deeply troubled by the worsening crackdown, not just on Uighurs (but also) Kazakhs, other Muslims in that region of China," State Department spokeswoman Heather Nauert told a news briefing, renewing concerns expressed in recent months by top administration officials. She acknowledged that the State Department had received a letter from a bipartisan group of U.S. lawmakers at the end of August asking Secretary of State Mike Pompeo to impose sanctions on a number of Chinese officials accused of overseeing the policies. Those included Chen Quanguo, Communist Party chief in Xinjiang and also a member of the Party's politburo. "We have a lot of tools at our disposal. But I'm not going to get ahead of any potential activity that the U.S. government may take," Nauert said. "We're not going to preview any sanctions that may or may not happen." The Washington-based Uyghur Human Rights Project tweeted a photo of activist Dolkun Isa, president of World Uyghur Congress, at the White House on Monday along with the comment, "A meeting with White House officials today provided much-needed encouragement for Uyghur human-rights advocates." 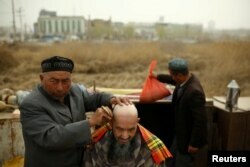 A street barber shaves the head of a man in Kashgar, Xinjiang Uighur Autonomous Region, China, March 24, 2017. "There are credible reports out there that many, many thousands have been detained in detention centers since April 2017, and the numbers are fairly significant from what we can tell so far," Nauert said.